I am a huge Survivor fan and have been watching the show religiously since the first episode aired in 2000. In Survivor Nicaragua, producers added a stupid twist called the Medallion of Power which enabled a tribe to receive an advantage at the challenge. Brenda wears the Medallion of Power in Survivor Nicaragua. Photo courtesy of Survivor Oz. The Sears Crescent house has its own Medallion of Power. At least that's what I call it. The Sears Crescent and its Medallion of Power in the 1921 Modern Homes catalog. 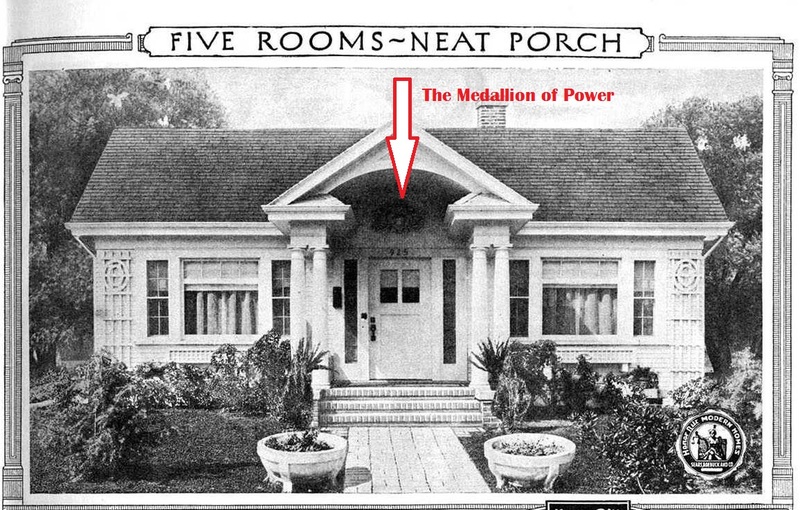 The Medallion of Power is blurry in the catalog illustration and hard to see. 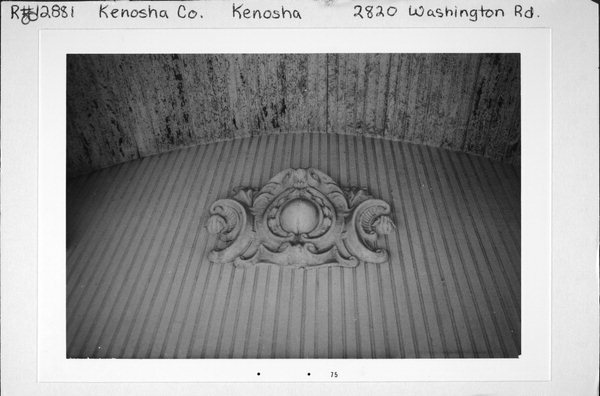 Here's a closeup of one from a Crescent in Kenosha, Wisconsin. Best photo of a medallion that I've seen. Photo courtesy of the Wisconsin Historical Society. Today, the vast majority of Crescents no longer have one, so when you see a Crescent with this original architectural detail, it is a real find. 533 Summit, Barrington. 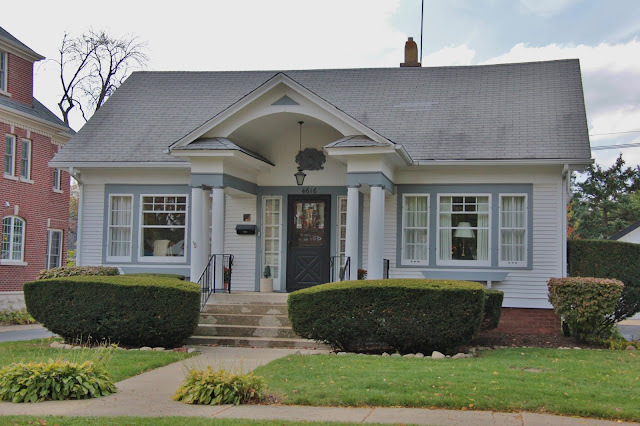 This house was built in 1928 for the Blanke family. What do I spy above the front door? The original plaster Medallion of Power! 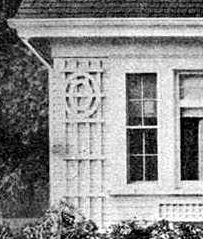 The Crescent in Barrington also features the original trellises shown in the catalog illustration and the original storm windows. 4616 Franklin Avenue, Western Springs. The decorative medallion is easy to see on this house. The Crescent was purchased for $2,200 in 1925. Photo courtesy of the Western Springs Historical Society. 1605 Spencer in Wilmette. This Crescent was built in 1925 for a cost of $10,000, according to the building permit. The original owner was the Schlueter family. 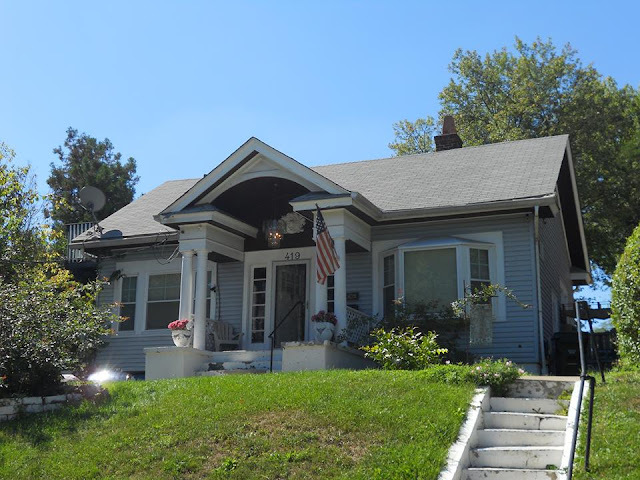 419 Purcell, Cincinnati, OH. Photo courtesy of Cindy Catanzaro. The Sears Crescent was a huge seller for Sears and you may have one in your town. Keep your eyes open for the formal, columned porch and the Medallion of Power! Ahhhh, it's so nice to see several beautiful, intact, real Crescents, especially after analyzing so many maybe-maybe-not possibilities lately, that have all lost their luster. Love the medallion of power!